My first furniture creations were plywood beds for my children, clearly utilitarian objects designed for specific functions. As I continued to design and make furniture my vision began to change and I saw the object as composed of related shapes, lines, and curves in three dimensions – a sculptural object that embodied aesthetic ideas. I imagine a shape, abstract or suggested by nature, and then make sketches with many variations in order to develop the design. After the basic design is established I go through a problem solving exercise involving selection of materials, defining structural and mechanical requirements, and satisfying functional needs. This problem solving process provides intellectual stimulation and great satisfaction. I prefer a spare and elegant aesthetic that incorporates relatively few decorative accents. I use woods that have intrinsic beauty of color and grain to reinforce the design concept. 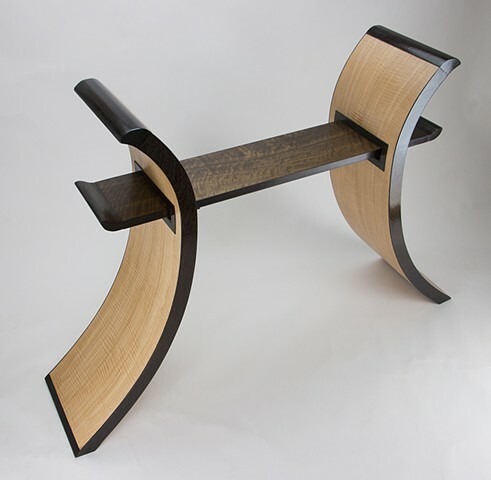 With each piece I enjoy exploring the use of a new material, technique, or design, and this has enabled me to continually develop and expand my skills.My designs have been influenced by furniture makers Wendell Castle, Jere Osgood, George Nakashima, and Michael Fortune.